Before I start on this month’s topic, I have a couple public service announcements to make. First, don’t forget that this weekend ESPN2 will be airing a men’s fastpitch game this coming weekend (July 21 or 22). The mere mention of men’s fastpitch makes some subscribers to this newsletter upset but, for others who’ve never seen it, this is an excellent opportunity. The game was played last weekend as there was a men’s international series being played at the same time as the Women’s world cup. The game on ESPN2 will be USA vs. Japan. I won’t spoil it for everyone and tell you who won. Secondly, the ISF (governing body of international softball) has launched their campaign to get softball reinstated into the Olympics for 2016. If you visit the website that has been created, there is information there about how to help and product to purchase which may help fund the reinstatement process. Go to <www.backsoftball.com>. Of course, I can only wonder if the ISF has any intention of trying to include men’s fastpitch into their Olympic fight. Baseball is eliminated so, why not push for men’s fastpitch? There has never been a better time than now. So, visit the website and offer your support. I don’t watch a ton of softball on TV. But, I did catch a bit of the USA-Venezuela game on ESPN during the World Cup. Crystl Bustos hit a 298 foot home run that made nearly everyone’s chin drop. Some of the credit for the ball going that far has to be given to the bat she’s using and the ball she’s hitting. But, there’s no doubt that she got every bit of that ball and it was crushed. The following day, the ESPN reporter mentioned that Crystl heard the Venezuelan coach yelling (in Spanish) to throw her “inside riseballs”. Little did they know, Crystl understands Spanish. So, Crystl knew what was coming and was ready for it. This makes one wonder whether the pitching performances seen in the College world series and at the World Cup are THAT good, or is the hitting THAT bad? Perhaps it’s a bit of both. During the college world series, so much hype was given to the Arizona pitcher’s change up and how effective it was. It was reported that Tennessee actually tried to ‘practice hitting change ups’. I’m not sure how someone does that but, nevertheless… that’s what was reported. Do you think Tennessee would’ve done better if they had known when Arizona was going to throw the change up? Of course they would. For a hitter, knowing what’s coming is 1/2 the battle. We call it “picking the pitcher”. That’s what it’s called when the pitcher does something (subtle or obvious) that gives away what pitch is coming. For some reason, hitters today are not taught how to pick pitchers very much. Perhaps part of the reason for this is because most of the hitting coaches today focus on teaching swing mechanics. They want everything to be mechanically correct in the swing and will spend hours upon hours teaching the correct swing. While there is no doubt this is important, I believe adjustments need to be made in a batter’s swing to hit a ball that is rising or dropping. Those adjustments can often alter the ‘mechanics’ of the swing. If all that was important was a ‘sweet swing’ and not ‘pitch identification’ then in theory a batter could stand in the box blindfolded and hit the ball. Sounds silly right? Now, just imagine if you have the ability to know what pitch is coming before the pitcher throws it. Wouldn’t that make life a lot simpler as a hitter? Of course it would. Many of you are probably wondering why I’m talking about hitting when this is a pitching article. It’s because so much of what I do when I coach pitchers is teach them how to conceal their pitches. To reach the highest level of softball in the world means they will be facing the world’s best hitters. If those hitters have you ‘picked’ and know what’s coming, you’re not going to fool them. If you watch close enough and know what to look for, every pitcher does SOMETHING to tip off what pitch they are going to throw. I once knew a guy who gave his change up away every time in the most unusual way. When his hands came together at his waist and he was leaning back preparing for his explosion forward, he would subconsciously stick his tongue out above his top lip. By watching his face, the hitters could tell if the pitch was going to be slow or fast. Some people are so good at picking pitchers, they will actually read the forearm muscles of the pitcher, which flex differently as they grip the ball for various pitches. At the men’s world championships, no matter how hot it is, nearly every pitcher is wearing long sleeve shirts to insure he doesn’t flex his forearm muscles. Now, obviously… that’s the extreme. But, what about some of the more simple ways? Take the drop ball pitch. Until I started teaching pitching, I never knew there was 2 ways to throw a drop: Turn over and peel. Some will argue that both are effective and both should be taught. However, in learning the turn over drop… many pitchers are taught NOT to push off the rubber hard/far, take a short step, and follow through to a completely different angle/side of the body in order to get the wrist on top of the ball. This motion looks 100% different from the other pitches being thrown. If you believe the power in pitching comes from the legs and that the elbow needs to snap for the arm whip, then those 2 things are being reversed to throw this pitch. Yet, if you watch Cat Osterman on TV.. every pitch looks mechanically identical. All she’s doing is spinning the ball differently from one pitch to the next. She is not telegraphing her pitch by changing her delivery. This also promotes her to stay into a pitching rhythm. I always tell people that I’m not very smart anyway and it would be too much for me to learn 4 different ways to pitch (4 different motions) for 4 different pitches. Yet, that is exactly what’s taught to many young pitchers. Put this in perspective another way, do baseball pitchers change their mechanics from one pitch to the next? No. They are trying to keep the same motion so the hitters don’t know what’s coming and mechanics stay smooth. You don’t see a pitcher stepping far to the left to throw a curveball and stepping straight to throw a fastball in MLB. Moreover, it’d be suicide for a pitcher to throw their curve ball from a different arm angle as they do their fastball. Good hitters will see the difference and react. Once in a while, a baseball pitcher will change his arm angle on the pitch to give the hitter a different look. But they are not throwing a Fastball with one pitching motion, and a curveball with another pitching motion every time. That’s a recipe for a high ERA. 99% of softball pitchers are taught to throw a “fastball” by gripping the ball across the seams and letting it roll off the fingers. You may have noticed in catching them, that often times their “fastball” actually has a DROP to it. This is because the ‘fastball’ and peel drop should be identical. It’s not necessary to do some kind of “pull up” action on the peel drop, as if they are starting a lawnmower. Don’t over complicate this. The spin is what makes the ball move and the release point is the key. The earlier the ball is released (usually at the first hip or where the front pocket would be on a pair of jeans) means the ball will start out level and the rotation will make it break. The later it’s released, past the front pocket, will mean the ball has to fight a slight trajectory of going upward. These are the flat pitches and as the hitters get better and better, these are the pitches that get smashed. The ball will get to the catcher before the ball loses it’s slight upward trajectory, these are the ones that appear ‘flat’ or a “FASTBALL”. But, releasing the “fastball” earlier means the ball will have a nasty bite to it downward. The bonus in all of this is, they can throw this pitch with at full speed, using the same mechanics they would for other pitches. This equals more velocity, more movement, and more deception to the hitters. So, it begs the question… why throw a flat pitch on purpose (‘fastball’) when with the same motion/mechanics they can make it move? Now, with every newsletter I do, I get a few people who write back and dispute something I say. In this case, people will say “My daughter throws a turn over drop and has great success with it”. If so, fine. Then disregard the above. But, what I do know is this: if I’m changing my motion from one pitch to the next and I have to face Crystl Bustos….. I hope she doesn’t know what pitch I’m throwing. I always tell people that I want to train pitchers to strike out the world’s best, not the best in the neighborhood. That means, what works at certain levels doesn’t always translate into working at the highest level. I want pitchers to start working on how to succeed against the worlds best from DAY ONE. 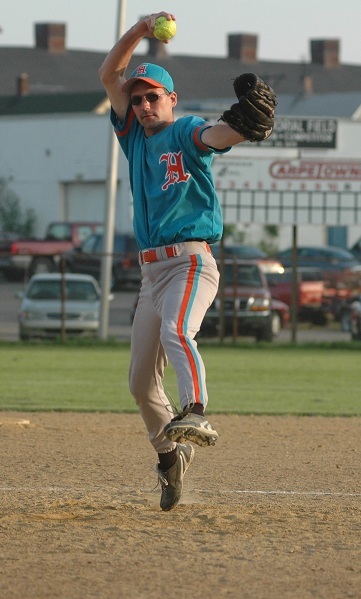 The back arm swing (sometimes called the double pump) is a very very common style of pitching. Osterman, Finch, Abbott, etc. all do this. Some believe this helps them get extra arm whip in their pitch. I personally don’t do it because I believe the power and speed in pitching come from the legs, not the arm. But, one of the main reasons I’m not a fan of this is because it shows the ball prematurely to the hitter. As the hand/ball drop out of the glove for the back swing, the batter gets 2 ‘snapshot’ looks at what grip is on the ball. 99.999% of pitchers have different grips for different pitches so, a hitter who is trained to pick the pitcher is given a preview of the pitch being thrown. You may think the arm swing happens too fast for a hitter to see it. Wrong. Most hitters are already watching the pitcher’s hip anyway, where the ball is being released. So, if they concentrate on watching the ball as it’s dropped out of the glove, look for any obvious difference from one pitch to the next, they will have an immediate advantage over the pitcher. Learning how to read pitchers takes time. By watching what other pitchers do to give away pitches will help your pitcher to be sure they don’t do the same thing(s). Hitters already have the advantage of high tech bats, rock hard balls, small strike zones, and antiquated restrictive pitching rules. Why give them anything else to use? When they know it’s coming, they’re 1/2 way to getting a hit. Ask Crystl Bustos.